Each mod is working relatively as it's supposed to. However every single npc including my character is stuck in T-Pose and no one is moving or walking around. I've made sure the GenerateFNIS_User is set to use admin privileges but I'm not sure what else i can do without compromising the load order. 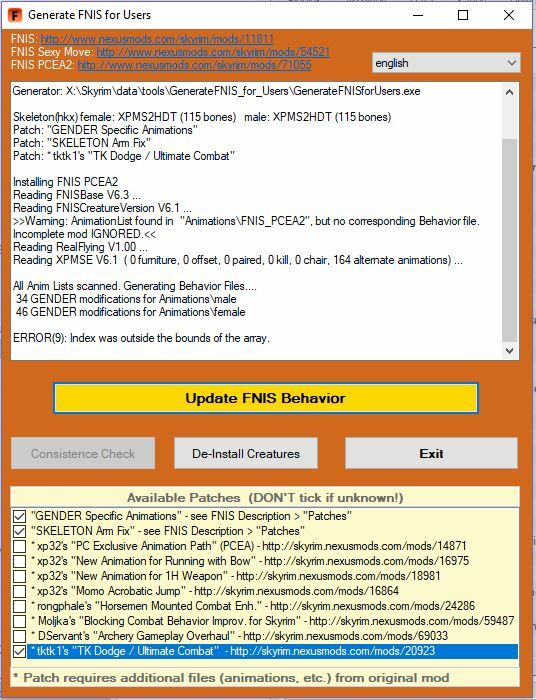 Hey bro you need to rebuild fnis behavior file a quick search on the forum should help ive also made some videos . i seem to keep getting this error whenever i try to update FNIS behavior. ive tried adding the extra files from the overwrite folder at the bottom of the MO but that doesnt seem to change anything. Any advice?